Frozen Summer Fun Extended at Hollywood Studios! As you may or may not know, Frozen Summer Fun has been taking over Hollywood Studios this entire summer.Fans of the movie has flooded to the Studios to enjoy a ton of Frozen fun. Not only can you attend a Sing A Long with Anna, Elsa, and Olaf, but you can also attend a daily parade with the movie characters, a skating rink and area to build your own snowman, and nightly fireworks. Frozen Summer Fun was slated to end on September 1st, however Disney announced today that the Frozen fun will be sticking around Hollywood Studios until September 28th. The fun will stay the same daily except for the fireworks. Starting the 2nd of September, fireworks will only be shown on Friday, Saturday, and Sunday nights. 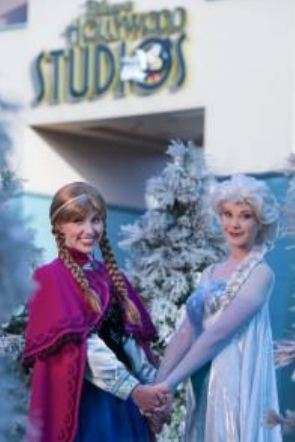 No doubt, Frozen Summer Fun has been beneficial to Walt Disney World and Hollywood Studios. Anyone who has attended Hollywood Studios can agree that Frozen has been a huge hit! Don’t believe me, just look at the sales of Olaf stuffed animals and the small army of Anna and Elsa’s running around the parks! None the less, Frozen is here to stay! Have you attended Frozen Summer Fun? If so what did you think? If not will you try to make it??? I know we will enjoy it more when the heat goes away! Frozen Fall Fun sounds great to us! Next Post Hogwarts Express carried 1 Millionth Guest Today!